"This is the kind of story that Vatican TV really shouldn't do. Even if they ran the story with all kinds of disclaimers, those disclaimers won't make it through into the popular media. 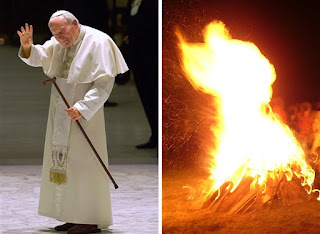 The mere fact that Vatican News Service is carrying this story will be taken as indicating that the Vatican supports this interpretation of the bonfire image." People will take this as some sort of "miracle" proving John Paul II is among the blessed when in fact it is no such thing. "This is bad because it strains credulity enough to have saintly images appearing in tortillas and pieces of toast and on the sides of buildings. Finding one in an image of something as dynamic and as constantly-changing-in-shape as fire is completely beyond the bounds. If you take enough pictures of any bonfire, you'll be able to find such images in it." True. This just makes Catholics look superstitious and stupid. I think this third and final point by Jimmy Akin really needs to be taken into consideration. He says, "And then there is the fact that fire isn't exactly the most . . . er . . . traditional symbol of what it's like in heaven. I mean, if you want a message that JP2 is in heaven rather than . . . one of the hotter regions . . . is a bonfire the best place for such a message?" Point well taken! Let's hope this dies away and that people don't start making pilgrimages to this guy's fire pit, just like they did to that fountain dedicated to JPII in Krakow (or it might have been another Polish city). Perhaps people will start claiming this is an authentic miracle because of all the good fruits that will come of it: pilgrimages to the holy fire pit, people saying the rosary there, priests hearing confessions, people weeping. After all, good fruit automatically validates any apparition, right?? It is a weak spirituality that seeks after such tenuous and silly "miracles."